Governor Jon Corzine’s brief flirtation with positive job performance ratings last month has ended, according to the latest Monmouth University/Gannett New Jersey Poll. His semiannual report card continues to average a “C-” from the New Jersey public, while his grades for cutting waste and his level of effort have declined. Battered by a year of personal and political hardships, Gov. Jon S. Corzine is struggling to catch a second wind. In April, just as Mr. Corzine began to embark on an ambitious agenda, he was severely injured in a traffic accident and then endured months of painful rehabilitation. Through it all, he faced mounting criticism from Republicans and fellow Democrats and opposition from the public over his proposal to slash the state’s debt by refinancing its toll roads. He also fended off persistent questions about whether his dealings with a former companion, who is also an influential labor leader, had improperly intruded into the public’s business. Gov. Jon Corzine admitted voters sent Trenton a strong message about no more massive borrowing, then in the same breath said he will continue with building stem cell research facilities because borrowing for them was approved previously. Huh? WARNING: TRANSLATION of Governor Jon Corzine’s complex statement of June 28 from Governmentaleeze to English. This document could cause taxpayer’s nausea and vomiting. Consult your physician if side effects continue. 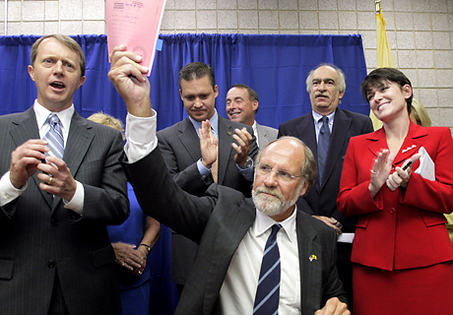 CORZINE STATEMENT: “In countless ways, New Jersey is the best state in America. But we need to invest in our future if we’re going to stay on top. As a result of decisions made across administrations and across party lines over the past 20 years, New Jersey has amassed over $30 billion in debt and staggering unfunded pension and healthcare liabilities. TRANSLATION: The strength of this state has been drawn from its people, not the government. This was once a bastion of free market capitalism. Not any more. New Jersey leads the nation with the most destructive progressive income tax and advanced social engineering schemes. We have the highest sales tax, highest property tax, and third highest debt in the nation. Rather than reduce the size of government and make it affordable to taxpayers, we will raise taxes to fund lucrative employee salaries and benefits handed out to political cronies. Wake up, New Jersey taxpayers - you work for the government, it doesn’t work for you. He has cut way back on his pain medication to an occasional dose of ibuprofen, his aides say. But he still tires easily, walks with a slight limp and shifts around in his chair to find the most comfortable position during long meetings. He has relished having the time to sift through the finer grains of public policy, as exemplified last week by a spirited defense of his long-marinating plan to restructure the finances of New Jersey's toll roads. Still, his public appearances have been far fewer and more cursory, and he spends most days at his temporary quarters at the governor's mansion in Princeton, often awaiting visitors or doing arduous physical therapy. A state ranking of highway conditions by the Reason Foundation and the University of North Carolina at Charlotte. Researchers evaluated roadways by traffic fatality rate, congestion, pavement condition, bridge condition, highway maintenance and administrative costs. Bet you can't guess where New Jersey came out on the list. Click on the full story link. The expanding inquiry, which had been focused on one influential senator who headed the powerful appropriations committee, is now looking at other lawmakers as well, including a Hudson County assemblyman whose estranged wife received a $100,000 state grant for a day care center she operates, according to two sources with knowledge of the investigation. New Jersey legislative officials were hit with a volley of federal subpoenas yesterday, in a rapidly expanding corruption investigation into the Statehouse by U.S. Attorney Christopher Christie. The subpoenas were served on both the Democratic and Republican leadership in the Senate and the Assembly -- seeking information on how millions in public funds were handed out over the last three years. It was the latest development in a federal probe that began last April with an investigation into state Sen. Wayne Bryant (D-Camden), who was accused by a federal monitor of using his position to steer funding to the state's medical university after he received a "no-work" job there. The matter has now expanded into an inquiry into how lawmakers divvy up public funds. Gaze across the border to New York state, and see what it looks like when a governor is willing to draw blood in the fight for reform. Gov. Eliot Spitzer is getting mean and personal these days. He's visiting legislative districts to attack his opponents by name. He's refusing to help them raise money. And he's promising only more blood and tears if they keep resisting him. The twist is that his main targets so far are not his Republican opponents. They are members of his own Democratic Party. If only Gov. Jon Corzine could catch that virus. TRENTON — Lawyers for the U.S. Attorney's Office and [NJ] state Office of Legislative Services said nothing publicly Wednesday after a closed-door, 80-minute hearing before a federal judge about a subpoena that the OLS is reportedly blocking. The two sides met before U.S. District Judge Mary Cooper concerning a subpoena related to a grand jury investigation of whether lawmakers used their positions to illegally steer state grants to entities for personal or political profit. The probe began as an examination of state Sen. Wayne Bryant, D-Camden, but could include others. Three groups of lawyers representing different interests left the room seemingly bound by court order to keep the grand-jury proceeding sealed. Federal prosecutors and attorneys for the state Legislature are due to square off today in an increasingly political fight over the confidentiality of legislative records being sought in a criminal corruption probe. The closed-door hearing in U.S. District Court in Trenton comes after Gov. Jon Corzine reiterated his call yesterday for the release of documents being sought by U.S. Attorney Christopher Christie in an expanding investigation into lawmakers' possible conflicts of interest. "I think we ought to comply with the law and respond to the subpoena," Corzine said. "We ought to be taking those steps that give the public the assurance that we're getting our house in order with regard to ethics." TRENTON — Gov. Corzine came to Trenton promising ethics reform. Sounded good, but then he hired a lobbyist to write two major speeches. Behold the crumbling Corzine credibility. Lobbyist Eric Shuffler worked for former U.S. Sen. Bob Torricelli and Gov. Jim McGreevey, both of whom left office under dark clouds in disgrace. Shuffler also lobbies for Geico insurance, which wanted its lizard mascot on billboards at the George Washington Bridge. Earth to Corzine: You can't reform ethics until you recognize a conflict of interest. TRENTON - Gov. Corzine says he hopes to hold property-tax increases to no more than 3 percent annually and give local governments authority to implement their own taxes. Speaking on WKXW-FM (101.5) yesterday, Corzine said that he would like to cut the state's highest-in-the-nation property taxes as part of a tax-reform effort, but that keeping annual increases in check seemed more realistic.